I vespri i Catania, Italien: Reservér nu! for make the reservation it is necessary send us any deposit about 50% of the total price 2 weeks before your arrival in hotel. we are sorry but if the group not show in hotel ,or they have a reduction member,we are sorry but the deposit we not give you back. we can make for you a nice plan holiday with trip in all sicily ,special price for eat in a nice restaurants in the center,discount in a nice wine bar,tea room ec...we wiil wait you!!!! 'I vespri' is our small but particularly comfortable budget rooms , in an old palace building, in the beautiful town centre of Catania. Its position is very favourable as it is near the main establishments of cultural events and night-life entertainment in Catania. We are just 10 minutes from the wonderful Catania beach and just one hour to the adventurous Vulcano Etna! The hotel has been recently restored and offers you spacious, clean and bright accommodation. Shared Kitchen available. 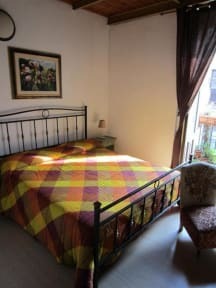 Our rooms with bathroom ensuite have also air condition and Tv. The rooms with shared bathroom have not the air cond., but a fun ( ventilator ), and have not the tv. The jovial and cordial staff, besides giving you a friendly welcome, can give you information about excursions and traveling in the area. 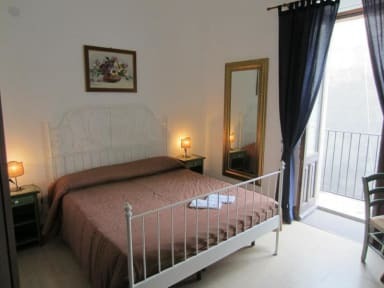 the restaurant is very near to the hotel,5 minutes walking,it is a typical little restaurant with all typical Sicilian food,you can eat fresh fish or meat and we speak English. Our other services are include free CALL taxi (please contact us in advance for this), free luggage deposit, free town-centre map, internet point as well as laundry service. The credit card of the clients is only of guarantee of booking and the payment in the hotel is accepted by credit card or bancomat and cash.